Yesterday, between a bit of house cleaning and getting ready for the funeral, I created my first digital layout! (Sorry I don't have a photo yet; I will take one when I purchse it.) There are some perks for ordering 10 layouts at a time, so I will be creating them and then purchasing them in bulk at a later date. I used photos from the annual Fourth of July Boat Parade that I haven't printed yet, a paper pack that I don't own (Can you believe there is such a thing?!? ), and the My Stickease from the pack (which I also don't own). 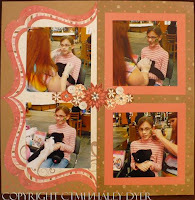 My layout has ribbon, bows, buttons, photo anchors, and more. (I included two of my favorite photos for your viewing pleasure.) 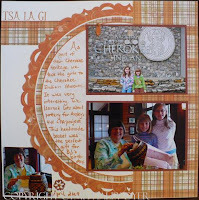 My layout is based on one of CTMH's exclusive layout sketches from Cherish or Imagine. (Of course I don't remember which one I used!) I was able to rotate and/or flip the pages to work with my pictures. Do you have tons of photos in boxes? Do you avoid taking photos because you have so many that you don't know what to do with them? 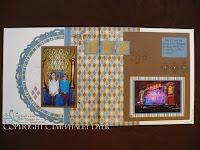 Have you ever thought about scrapbooking your photos and memories? 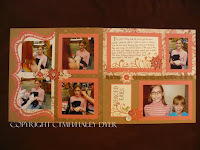 Do you want to learn how to scrapbook? Or do you have unfinished albums laying around? 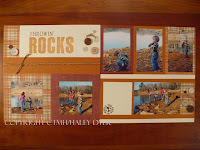 I am offering a beginner's scrapbook series (4 classes over 4 months) to help you preserve your photos and memories. You do not have to be a beginner to attend, but this series will be geared toward getting started and will help you get going. Each additional class is only $5 per class, but the class fee will be waived with a $25 minimum order. 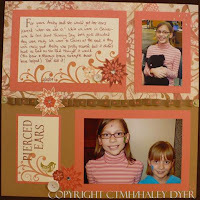 At each of these classes, we will create a two-page 12"x12" layout. 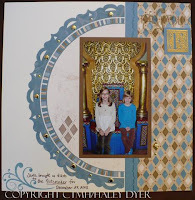 We will learn lots more about scrapbooking, plus you'll have completed layouts to take home! Leave me a comment if you're interested in attending. You do NOT have to be local to participate, although I'd love to have you here at my house. Things are busy around here- I'm sure you can relate- but I feel an overwhelming sense of gratitude and humbleness right now. 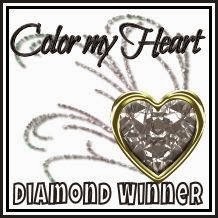 Thank you to everyone who pops in here and especially those of you who leave me comments! It means so much to me to think that my little corner of the world might inspire or somehow touch you. Thanks for stopping by! I guess I'm just taking a moment to appreciate this imperfect thing called LIFE. 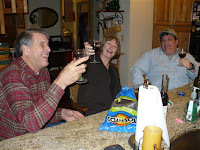 We were thrilled to have unexpected visitors Tuesday night: my Uncle Bob (Dad's brother) and Aunt Lynne from New Hampshire! (We thought they were headed to visit my parents in Florida but instead crashed at their house here.) My brother and I were both cooking in our crockpots, so we, along with my sister and her family, all contributed to a smorgasbord supper. The victims in Haiti also weigh heavily on my mind. We are so blessed to live where we do, and we shouldn't take it for granted. God bless the USA! Go hug your loved ones!!!! 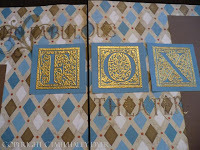 As promised yesterday, here are the other two cards I made at my Topstitch workshop. 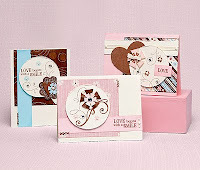 They use the Love Is in the Air stamp set that comes with the Topstich Workshop on the Go, and are pretty much a copy of the sample cards in the brochure. Easy peasy that way! Isn't it cool how you can rotate the card pattern for a different look? 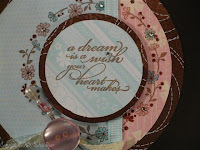 My "Dream Wishes" card was selected as one of this week's Top Trio cards over at 365 Cards! In case you missed my card, here it is again. You can read all about it on my post for 1/20/10. 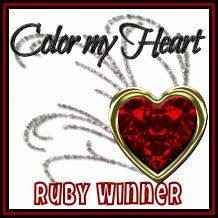 I am so super excited to have been chosen!!! Thank you! Any other tweet, I mean sweet, suggestions? 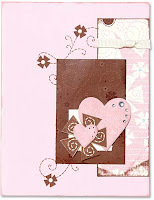 Come back tomorrow for two more cards using this same pattern. My friend and colleague Tammy was elected this year's Teacher of the Year at my school. I offered to make a card for our grade to give to her at her reception last Friday. 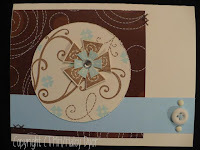 It's a 5"x7" top-fold card based on the Wishes pattern "Medallion." Our school colors are purple and gold, hence the color palette. 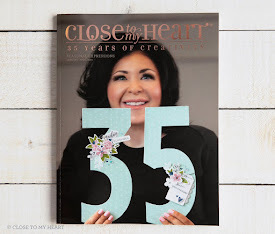 There's Lots to Love in the latest Close To My Heart TV "Art & Soul" webisode. Go check it out! 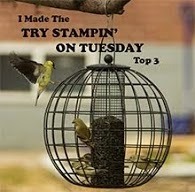 Click HERE or go to http://haleyd.myctmh.com/ and then click on the CTMH TV button on left. This webisode is less than 11 minutes, so check it out this weekend. You'll love it! How could I resist the challenge? 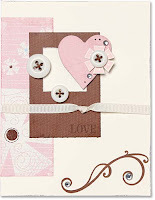 It was so fun to make a card just because I wanted to! I have no idea who the lucky recipient will be. I may save it to embellish a scrapbook layout of my little princess. My card is based on the "Inner Court" sketch from Wishes. The National Papercrafting Blog is asking everyone what their favorite papercrafting embellishment is, and if you post your answer online, you could win a FREE Felicity paper pack/stamp set collection! I personally love all sorts of embellishments, but it seems like I can't get enough SPARKLES (regular and bitty)! They're self-stick so I don't need any other products, they're oh-so-easy to use, and they're inexpensive (100 for $2.95)! What's not to love?!? 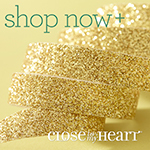 What is your favorite embellishment? Maybe you can link your comment to the giveaway blog! 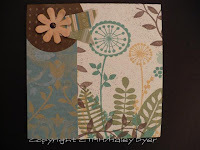 Here is the second layout I made using the Autumn Terracotta papers from the Felicity collection. It is based on the Cherish "Rise 'n Shine" layout sketch. 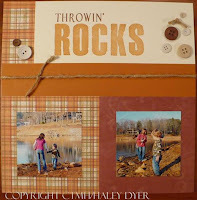 I love how these guides make scrapbooking sooooo easy! They give the dimensions to cut and complete instructions, but you can interchange elements, make them bigger or smaller to fit your photos, etc. Truly faster, simpler, easier! 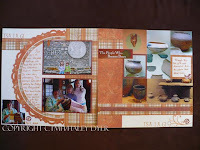 The title is stamped with the Felicity alphabet in Barn Red and the Rustic Alphabet in Autumn Terracotta. I embellished the layout with natural buttons and some jute (non CTMH) from my stash. 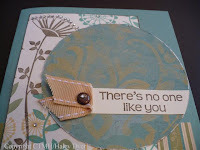 The little "You rock my world" on the journaling block is a rub on. 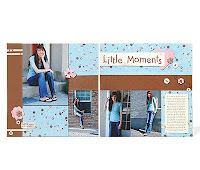 Imagine the possibility of scrapbooking your cherished memories! The Imagine guide makes it incredibly easy. I began with my photos from our trip to the Museum of the Cherokee Indian from last spring. I had about a dozen photos I wanted to include on my layout, so I flipped through the thumbnail sketches. The "Small Packages" sketch on p. 74 was perfect! I paired my photos with the fabulous Felicity special, and voila! If you'd like to get your hands on the Felicity special, the Imagine book or anything else featured here, click on my Close To My Heart website button at right. If you've never tried one of the Imagine sketches, shoot me an email (haleyd@myctmh.com) and I'll send you a sample or two to try. 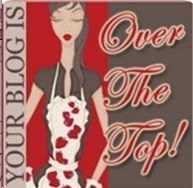 How, hop on over to my friend Carol's blog for more Imagine fun! 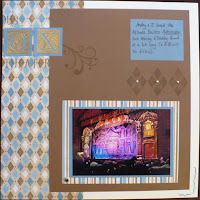 This layout commemorates our trip to the Fox Theater in Atlanta last Christmas to see "The Nutcracker." 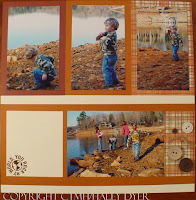 Unfortunately, we didn't have very many pictures, but this layout (copied from the Felicity guide included in the Felicity collection, but using the Twilight papers) worked perfectly for so few photos. Since I've confessed my boo-boo, do you have any memorable mistakes to share? 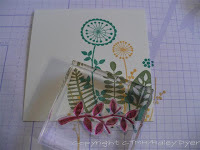 Here are the beautiful new samples from the stamp of the month swap that I participate in each month. 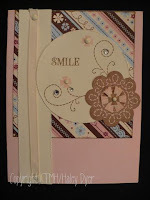 You saw my 8 cards at the beginning of the month (featured on the blog hop and at the bottom right). All of us used the same stamp set, True Friends, and the same paper pack, Veranda. The individual beauty of each card just takes my breath away! 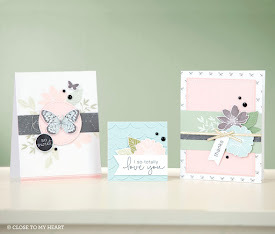 Top left to right: Bridget highlighted her sentiment with one of the brackets and an adorable butterfly found in the new Just Blooms Spring Blossoms. 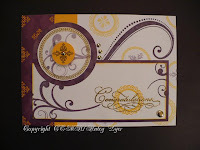 The details on Tanya's card (including some heat embossing) have to be seen to be believed. The front of Camy's card is actually a pocket holding the friend tag. Can you see how Chris paper-pierced her scalloped border? 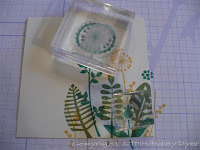 Bottom left to right: Taralyn also used a Just Blooms flower on her card, and its center is filled in with Liquid Glass. 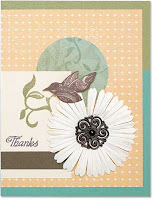 Carla inked up a White Daisy crotched flower and mounted it on Juniper cardstock. Don't you like how Pam cut her sentiment into quarters? Imagine my surprise to find out that I won the weekly sketch challenge over at CPS (Card Positioning Systems)! I think it was just a random pick, but still, it's exciting! :) I will even be getting a prize. How fun! Thanks, Sarah, for the heads up. For this hop, I created two cards based on the same Wishes 5"x7" sketch, "Bullseye," using the same new stamp set, One of a Kind (D1410). I love how changing the color scheme can totally change the look and feel of your project. Talk about versatility! 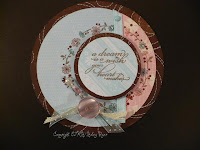 My first card uses the luscious new Veranda paper pack and the new Veranda Creative Basics papers/Creme Brulee ribbon. 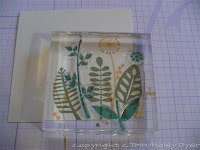 After stamping the foliage and flowers on the large rectangular Colonial White panel in Creme Brulee, Garden Green, Juniper, and Cocoa, I scissor-distressed the edge of the circle piece. Though Sparkles aren't a new product, you can now get Bitty Sparkles in bulk: 100 for only $2.95! I used them quite liberally on this project. I love accenting a Bigger Brad with a Sparkle. 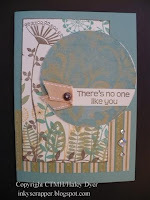 My second card uses the same sketch but I pumped up the fun with the new Caboodle paper pack! 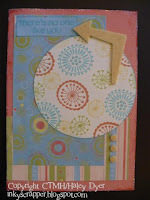 I stamped the round geometric images in Crystal Blue, Sorbet, Sweet Leaf, and Buttercup on the circle piece. Mimicing the circles from the large rectangular B&T panel is a fun way to keep your project looking good. Moving the sentiment to the top left also changes the look of this card, and the Buttercup Heartfelt Whimsy arrow makes sure that you don't miss the message. 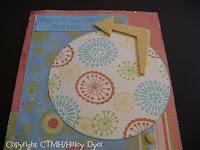 I couldn't resist a little bling, so I highlighted the center of each stamped circle with a little prisma glitter. (Just dot a little glue on each center, pour on the glitter, and dump off the excess.) The sparkly edges actually came about as a way to fix a mistake: I didn't realize I'd gotten some glue on a portion of one of the edges (still have no clue how that happened!) so I decided that if a little looked good, a lot would be terrific! 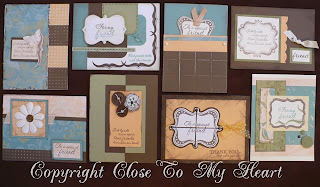 Thanks for checking out the versatilty of Close To My Heart's stamps and paper packs. What is your favorite new product, or what would you like to see featured here? 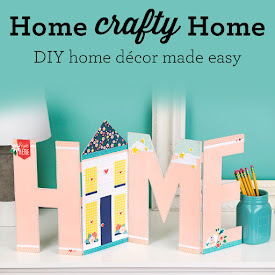 Now hop on over to Antoinette's blog to check out her great new project! 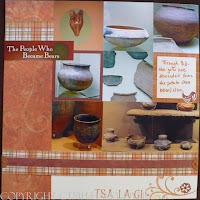 The papers I used here are from the Sorbet part of the collection. Do you love the scallop on the left side? It is one of the die cuts of the Felicity special, cut in half. The left page itself is based on the Reflections sketch, "Half & Half- 4 Photo." 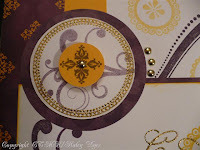 Even though I'm not crazy about cutting, it was totally worth cutting out all the flowers and medallions for this layout. Layering the pieces gave it extra pizzaz. The sparkles bling and buttons don't hurt either. The right side layout also came from Reflections: "Triple Play- Basics." I really, really want to hoard that flowery paper on the top half, but I will force myself to use it on various projects. I still have a sheet and a half left... Again, this side is embellished with cut-out stamped images, sparkles, and buttons. Techniques: I used my new Crop-o-Dile Big Bite to punch holes in the bottom left of the left page, bottom right of the right page, and the top right photo matte on the right page to mimic the polka dots on the B&T paper. For the two sets on the actual base pages of the layout, I glued some Sorbet card stock behind the layout to peek through the holes. I also used that fun paper pleating technique to make the "ribbon" running across the middle of the right page. 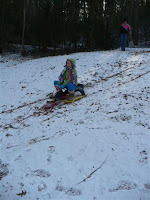 We let out school early yesterday ahead of the snow (just in time), and after about an inch or so fell, school was called off for today. 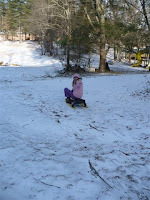 The girls loved having enough snow for sledding! Also, having Ansley's BFF over for the day made it even more fun for them (and me too since they play well together and enterain each other pretty well). 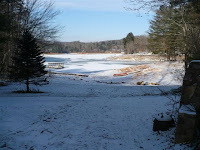 It hasn't been above freezing for over a week, so our lake has frozen almost completely over. In the photo at right, much of the ice is snow-covered. The areas that appear to be water are actually more ice; only the patch at the left is open water. Since the lake has a river running through it, the moving water is keeping it from freezing solid (for now). We're expecting below-freezing temps until Monday, so I don't know how soon this white stuff will go. It was fun today, but it's time for it to go! Join me on Saturday, 1/23, to create some or all of these lovely Topstitch projects! (You do NOT have to attend to purchase a workshop kit and instructions, but we have a great time getting together!) 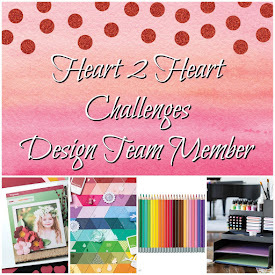 You can attend just the scrapbooking, just the cards, or both! Also, don't worry if you think the samples are too "girlie" for your taste: I will show you how to make it more masculine. Kit prepayment is due by 1/10/10. *The Budget option does NOT include the workshop guide, which is fine if you're coming to class. Email me at haleyd@myctmh.com to reserve your kit and spot! Thanks. 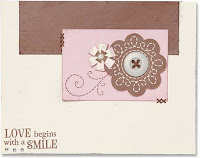 Here are the "bonus" card samples that you'll be able to create with your kit purchase. Aren't they lovely? Do you ever create something that you absolutely love? That's how I feel about this card! It measures 4"x4", and because I was making it 40 times over for a swap (Yes, that's forty identical cards! 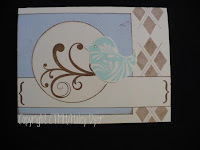 ), I used a technique called "cluster stamping." 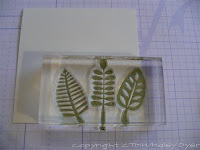 I began by stamping the bottom leaves in Garden Green. Next, I added my Creme Brulee accents. Third came the Juniper images. Finally, I finished it off with some Cocoa vines. 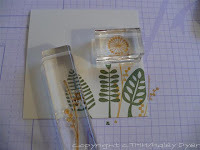 This card uses the One of a Kind stamp set, Veranda paper pack, Veranda Creative Basics paper pack, Just Blooms Spring Blossoms (Creme Brulee), and an Antique Copper brad.